Disclaimer: We received two complimentary passes to a screening to the movie in exchange for an honest review. We were not required to write a positive review, all opinions are our own. 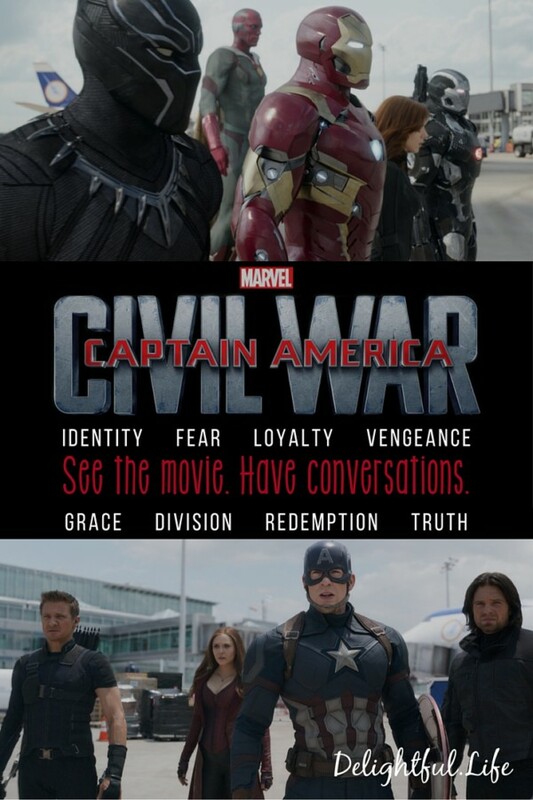 When we got out of the car after seeing Captain America: Civil War on Monday, my husband and I immediately began recording our thoughts for a podcast episode. It was brilliant conversation both in the spoiler-free segment and the spoiled-filled; the recording didn’t work though because I didn’t figure out new tech before using it, so I sat and pouted for the next five days instead of coming here to tell you why you need to see the movie. That worked out alright though, because now my thoughts may be more beneficial than just, “Aaaaagh! Good! So yay!” But only slightly. First, the answer to the most important question: no, neither of us changed allegiances. In other words, Kyle is still wrong… but my goodness, if everyone I have talked to that has seen it didn’t at least begin to see where the other side was coming from. In the beginning of the film we find ourselves in the aftermath of Sokovia, since which there have been several other incidents where innocent people lost their lives and cities were left with mass destruction as a result of an Avengers intervention. While most of the Avengers (minus, most notably, Hawkeye and Hulk) are staying at the compound, they aren’t all in complete agreement on whether they can live with the fact that their line of work will lead to casualties. What begins as a thoughtful discussion between friends is heightened into, well, civil war when the United Nations wants to step in and hold enhanced people accountable for their choices – i.e., control the actions of the Avengers. Apparently, the cleanup efforts of Stark’s Damage Control aren’t consolation enough when real stories of people who have lost their lives begin to come out. Some of the Avengers decide to sign the Sokovia Accords, a large book of regulations created to enforce the UN’s sovereignty over them. Others are vehemently opposed, while others still allow themselves to be convinced one way or another…. and chaos ensues. Captain America remains as classy as ever, but becomes more multi-dimensional than I think we’ve ever seen him. He makes controversial choices – some that are just plain wrong – while still maintaining his integrity in that he makes every decision based on what he truly thinks is right. Tony Stark is all Stark. He’s witty, good-hearted, and misunderstood. He’s the victim of his past and opinions people have formed against him, but also a victim of his own internal struggles. When we begin to see more of his story he quickly suppresses it, summarizing his character in a brief but powerful interaction with Natasha. While he’s obviously shaken and out of sorts, she asks Iron Man if he’s ok. He takes a breath, quickly regains composure (immediately changing his entire demeanor as if a switch has been flipped), and says, “I always am.” And just like that, he moves on. It’s an impactful moment, but only if you even notice it. We do learn though, that of course he isn’t always ok – and one thing above all others can set him off like a loose cannon. The introductions of Spiderman and Black Panther – both the introductory scenes, and the inclusion of them in the story at all – are excellent. Black Panther (who wasn’t heavily featured in trailers) makes pivotal arguments, has incredible motivation, and goes through more than one powerful emotional transformation. 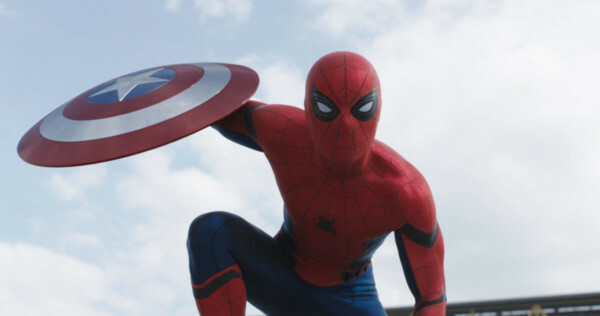 Spiderman saved my heart on numerous occasions, and I can’t wait to see what they do with this character. 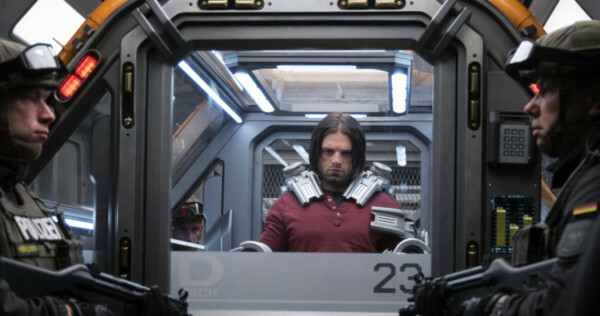 I forgot to watch Ant-man prior to Civil War (though I’ve seen it since! ), but it didn’t matter. Paul Rudd and Ant-man were excellent additions to the team, and jokes relating back to the standalone movie weren’t lost, even on those of us that hadn’t yet seen it. And the villain? (Villains, plural? Depends on who you ask…) Totally different than many other superhero movies, but fascinating and deceivingly masterful. 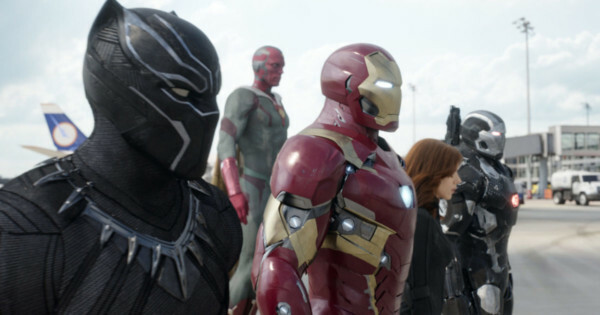 Black Widow, Scarlet Witch, Vision, Falcon, and everyone else in the film are just wonderful incarnations of themselves. Vision is just a little more human and relatable (and oh so funny! ), without being any less Vision, and without taking his presumed next story arc too far, too quickly. I’m not sure though. Without ruining anything (but seriously, go see it already so we can talk! ), things are… “fine”? Maybe? Everyone learns to see from one another’s perspective to some extent, and arguably agrees to disagree. But the implications of that – and everything that ensued to bring them to that point – can’t be undone. So…. when do we get to see these characters again?! 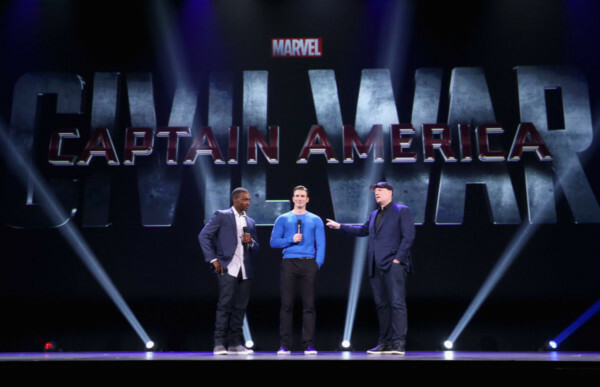 When we were at the D23 Expo in August 2015, Kevin Feige shared extended clips of this movie, sharing that they added an easter egg of sorts just for the folks there. The audience erupted in applause, but I had forgotten about that moment until we saw the scene again this week. We were kind of giddy; it felt like I had this incredible inside joke with the master of all things MCU. As with the other Avengers movies (ha! see what I inadvertently did there? 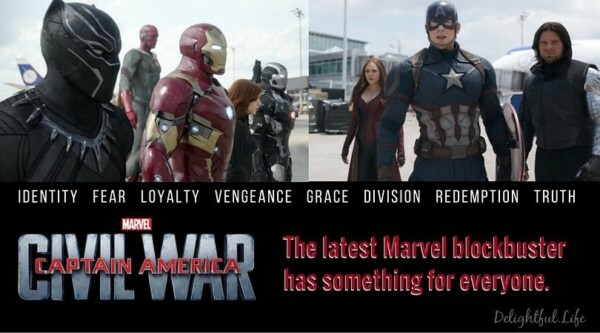 This is totally an Avengers movie, even if it focuses a bit more on Cap), there are lots of characters. After seeing Batman vs. Superman last month (and being easier on it than most people, while realizing its shortcomings), I was once again impressed at the ease with which the stories in the Marvel universe were woven together in a way that wasn’t overwhelming or distracting; I was as impressed as always that no matter how much was going on at a given moment, each person was distinticly unique. Brilliantly choreographed fight scenes paralleled that – at times there was so much going on that it just about became too much, when I was instantly pulled back in with the reminder how each person’s skills piggyback on and complement the others’. Aside from the emotional turmoil and sensory pain caused by them though, I did love the fight scenes! Some people will say they were too long, but they never once felt long or superfluous. As heartbreaking as the trailer was for many of us, the entire battle got even more emotional as great friends fought each other one-on-one, and it may have all become too much – were it not for hilarious, wonderful interruptions by the more non-traditional ringers that each side called in to help. It’s pretty well understood that aside from my obligation to be an informed voter, I don’t do politics. 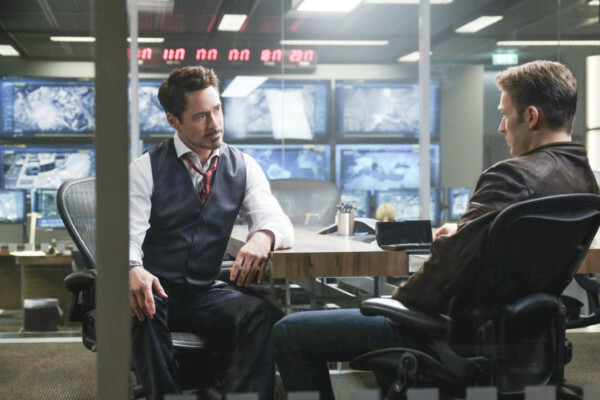 If you like talking foreign policy for fun, though, there will be obvious conversations for hours after the movie is finished, in which you find yourselves referencing Captain American and Iron Man as if they were real people you actually know. (Side note: If they were, I’d consider voting for just about any Avenger in the upcoming election.) Outside of politics, there is also great fodder for conversations on grace and forgiveness, faith in humanity, embracing ones identity, and the impact of revenge. For me, it was pure, unadulterated entertainment. I hope you stopped reading up there in the first paragraph and have already gone to see it.